HomeWho we areHistoryWhere Did the Chapel Come From??? 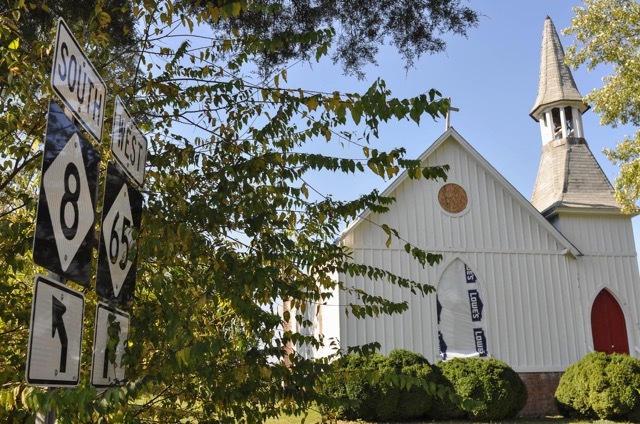 The carpenter gothic, board-and-batten St. Philip’s Church was completed in Germanton, North Carolina, in 1891. It was designed to seat 150 facing forward in 25 nine-foot long pews. The congregation grew to 22 people by 1895. Then the vicar died. 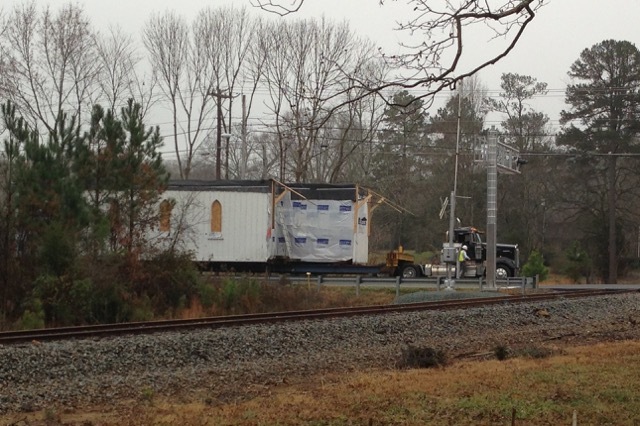 Episcopalians started moving to the burgeoning city of Winston Salem, ten miles to the southwest. For the next 80 years the congregation of 5-10 people and their descendants kept the church going. Then they died or moved away. In 1980, the church building came under the care of the Diocesan Historic Properties Committee. They organized a local committee to keep up the building and to provide two services a year for any who wanted to participate. They got the building listed on the National Register of Historic Places, not only for its simple architecture, but also because it had never had electricity or plumbing. It was exemplary of the 19th century rural church. By 2010, the local committee couldn’t recruit new members and it folded. A nearby Baptist church was interested in the land the building occupied. The Diocese determined to put the property up for sale and began to seek interested parties to move the structure, if possible. That’s where the Church of the Advocate got involved. A mission church of the Episcopal Diocese of North Carolina, Advocate was launched by three established Episcopal Church in Orange County, NC in 2003. Very aware of ourselves as a 21st century mission within the Anglican Episcopal tradition, we were intentional about developing new ways of being for a new generation in a new world. We developed our webpage and our presence in social media; we got involved in the community, and held our service at 5 PM each Sunday. We rented space for that Sunday worship, first in a Unity Church, then for five years in a synagogue. We earnestly considered the call to remain a nomadic church, unbridled by the maintenance of land and building. We looked at storefronts, got creative with outdoor processions downtown, held meetings in one another’s homes. We became known for our authenticity, our engaging and creative liturgy, and our weekly fellowship dinners, which extended the Eucharistic feast. Our reputation for engagement in the community was bigger than we were. We were a congregation that realized that the church is not a building, rather the church is the people of God, the Body of Christ. But six years into it, the task of setting up and taking down our worship space every week was losing its charm. More important, we began to realize what a more permanent location could provide for us and for our ministry. We wanted to offer a variety of opportunities for prayer, contemplation and worship. We wanted to offer hospitality throughout the week. We wanted to plant community gardens and invite people into public space to organize and be empowered to work for God’s compassionate justice in the world. We began to look for land. In January 2011 we closed on a 15-acre site. Funds to buy the land came from the sacrificial giving of the congregation, but also from the generosity of several octogenarians — friends from a generation that strongly believed that a church needs a building. From the start, we knew that the land was a gift and that we were being called to be faithful stewards of it. We could only justify “owning” the land if we had a vision for sharing it, for buildings with metaphorically “porous walls” which allow people to come and go freely. We wanted the site, the whole site, to be a resource to the wider community. We wanted it to be a place of contemplation and action, for restoration and service. Our vision developed to include a non-profit center, a residence for up to 15 people living in intentional community, a retreat center, an education center, and a Center for Theological Engagement or Restorative Justice. Fifteen acres can host a lot. But first, we needed a building in which to worship. And still, we were a small congregation without much money. We had just gotten to the point of considering how to build a 1000 square foot worship space when a member of the Diocesan Historic Properties Committee approached us about St. Philip’s Chapel. Would we consider moving the old church building to our site rather than building a new one from scratch? The idea resonated deeply with the congregation. As a people committed to environmental sustainability, we realized that re-using an existing structure was much preferable to new construction. As a congregation with many young adults, the building held a certain “retro” appeal. For others it was nostalgic. For all, it represented our commitment to cherish the past while making it new, to be rooted in tradition by not bound by it. The simple beauty of the all-wooden building resonated with our shared aesthetic. We also heard a call to allow the building itself to flourish, to be used for the purpose for which it was constructed, to be a place of worship and hospitality for a growing, vital congregation. Due diligence proved fruitful. We learned about Mike Blake of Blake Moving Company, who specializes in moving old buildings, Blake said it was doable, and the cost, even including the addition of electricity and plumbing, would likely be less than new construction. We confirmed that the building’s status on the register of historic places did not stand in the way of its moving. This led us to a tangle, though — the heartfelt opposition from some who lived in and around Germanton. While the Episcopalians of Germanton had long since died or moved away, several people of the region were attached to the beautiful wooden building. It was a visual touchstone for them, a place they identified with their small town. Their compelling arguments raised valid questions of ownership. The Episcopal Diocese of North Carolina legally owned the building. But the people who lived in and around Germanton had visually owned it for more than a hundred years. And several of them knew the Episcopalians who had lovingly tended the church in the mid-twentieth century. The Advocate was committed to giving the building new life and vitality for all the right reasons. But should that outweigh the more limited but bold efforts of the local population to try to keep the building in place and do the same? The conflict was painful for everyone. But the emotional, spiritual and financial investment of The Church of the Advocate was increasing. And the Advocate’s emerging passion for making the building accessible to all in all seasons of the year, combined with the matter of legal ownership by the Episcopal Diocese held sway. As did the youth, energy and hope for the future church that the Advocate embodies. Thus began the actual and the metaphorical process of “Moving Church”. It was not simple. The move itself was an adventure. To move a building a short distance, overhead lines can be taken down temporarily. But taking down lines to move a building over 100 miles is prohibitively expensive. Instead, Blake removed the bell tower and roof to keep the clearance under 16 feet. The stained glass windows were removed for safekeeping. As the building was taken apart for transport, previously invisible rot and decay revealed itself. The building didn’t just need preservation; it needed renewal. At each step we had to determine which parts should be declared unfit for restoration, which parts could be restored with re-used old wood, and which needed to be completely rebuilt with new lumber and nails. 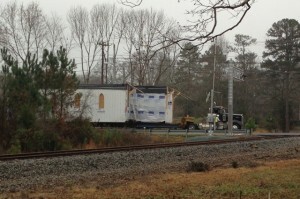 The building could not be moved along the interstate, but only along back roads. Every mile of the route had to be planned and approved by local jurisdictions. Road closures and police escorts had to be arranged. Overhead branches had to be trimmed and overnight stays had to be arranged. Moving church is slow business. It requires creativity and perseverance. And it requires a lot of communication all along the way. The night before the building rolled onto its new location, a group from the Advocate went out to its berth by the highway and prayed evening prayers. We celebrated “a church on the move,” and realized that we were being formed for our future. In the months that followed, the foundation built, the bead board ceiling covered with boards of insulation and on the roof, new shingles replaced the old. Insulation was blown onto the backside of the board and batten and the bead board walls returned. The original stained glass windows were restored and installed again. 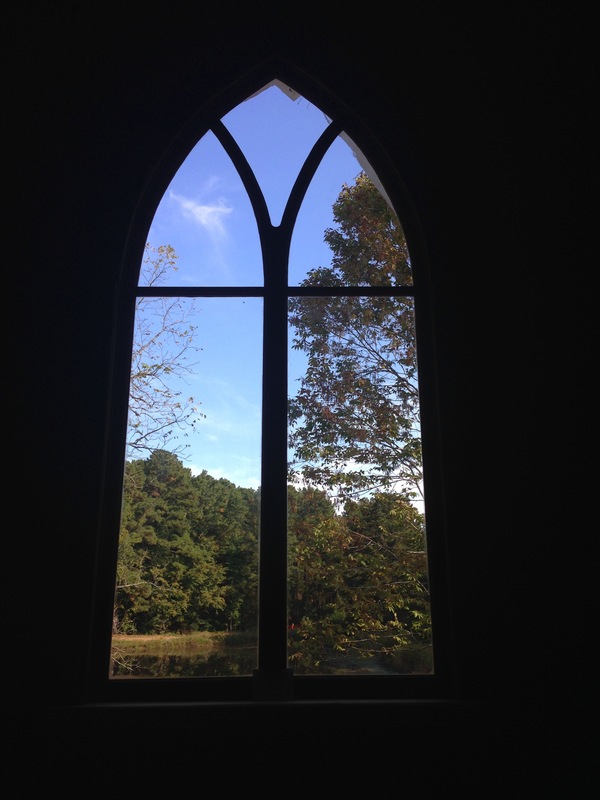 Only the window that faces liturgical east is different. It is clear glass now, and is called the Vision Window, given in thanksgiving for those whose vision and perseverance brought the building to this place. Handicap accessibility and plumbing were added. 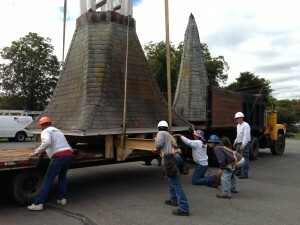 The electrician installed 21st century wiring and the steeple is now covered with long-lasting pine shake. The cross that had fallen from the steeple years ago was replaced with a new cross that rises high above the tree line. We sold most of the old pews, and received a donation of 90 chairs, which allow for flexible use of the space. The pump organ is gone, and a piano has been given to us. The acoustics inside the nave have been described as being “like in the inside of a guitar”, ripe for unplugged instruments and a cappella singing, which we understand to provide an experience of the Spirit moving among us. The old wood stove has become a credence table, holding the vessels for the people gathered, providing a different kind of warmth. The building is moved, but the church keeps moving, as long as we are open to the Spirit and alert to the world around us. If so, we will continue to cultivate gardens that are open to all and we will build with metaphorically porous walls. We will continue to cultivate a liturgy that is both an expression of the faith of the people gathered and that forms the faith of the people gathered; that is both a work of the people and a public work. We will mentor young adults in the discernment of ministry, and provide a space for teaching the traditions, and also for intentional and open theological engagement. We will be alert to the needs and injustices in our world and find ways to make God’s compassionate justice known. Carefully and patiently, we will examine our old structures and ways, and determine which have essentially rotted and can no longer function, which need to be preserved as they are, and which can be moved and restored, made new for a new generation and accessible to all. Moving a 19th century carpenter gothic church building 120 miles along back roads was exciting, and it makes for a good story. But moving church, the people of God, is by far the greater work.